It has been a tough, but very inspiring week. Behind the tragic tale caused by the super Typhoon Haiyan or Yolanda in the Philippines are stories of love, courage, hope and faith. I am amazed by the overwhelming support that my country has received from other nations. I am also very grateful that the concept of 'bayanihan' is still alive in this modern age and time. Here in the UAE, there are so many people willing to help. Fund-raising activities happened last weekend and a lot more in the coming weeks. One of the activities is the Fiesta for a Cause organized by Noemi, a kind-hearted Filipina expatriate in Dubai, the blogger behind one of my favorite travel blogs www.pinayflyinghigh.com. The lunch/dinner for a cause will be held at Rosso Amore restaurant and proceeds will go to World Vision. Please check the flyer for more details. Table reservation is a must. Please call any of the numbers provided in the flyer. 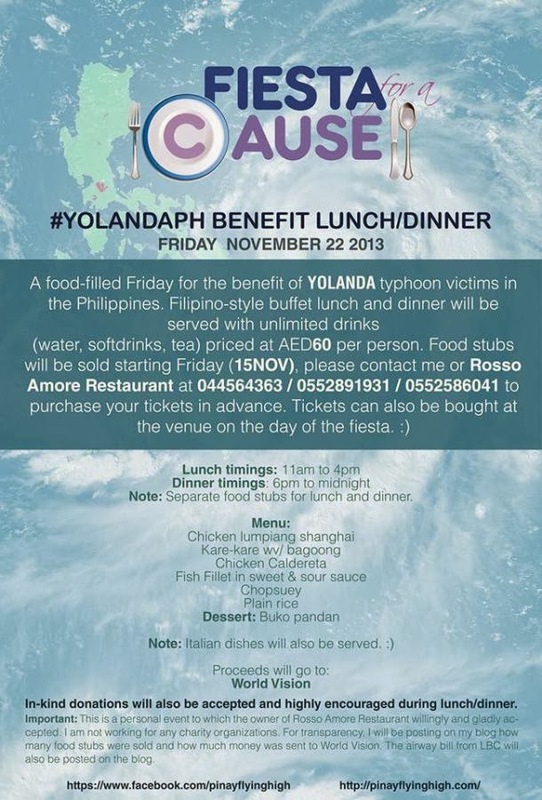 So, for the Foodies and those who are planning to dine out this weekend, this is the chance to satisfy your Filipino food cravings and help at the same time.